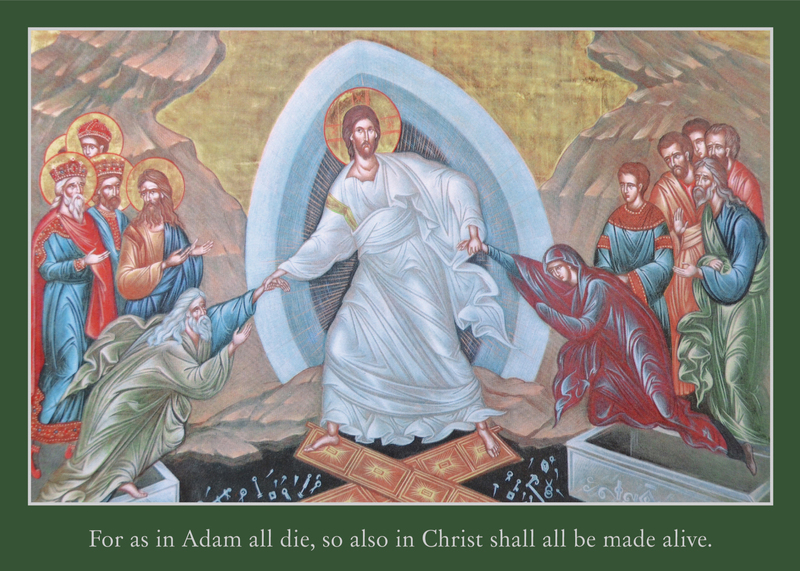 This vibrant depiction of Christ’s resurrection is rich in theological symbolism and full of confession. So that the details don’t go unnoticed, we’ve added this description to the back of the card: “Through His death and resurrection, Christ has broken the gates of hell and conquered death. He raises Adam and Eve from their tombs, grasping their wrists as they passively obey. His victory over death redeems all mankind, even back to the Fall. This scene foreshadows the resurrection of the body on the last day.” Citations on the back indicate that the cover verse is from 1 Corinthians 15:22 and the inside verse is Romans 4:24-25. Jesus our Lord was delivered up for our trespasses and raised for our justification.